Mixing 101: Baffled by Baffles? In our previous posting on configuring your mixer, we learned that the tank type and volume, viscosity, specific gravity and the process are key factors the mixing process. In this article, we dive into how baffle configuration and mixer mounting can prevent the undesirable flow pattern of swirling. Let’s look at a common tank configuration: an un-baffled cylindrical tank. If a mixer is center-mounted in this tank, what we see is a very inefficient flow pattern: the tangential velocities coming from the impeller cause the entire fluid mass to spin (Fig. 1). Basically, the entire fluid (and its solids) moves like a merry-go-round. 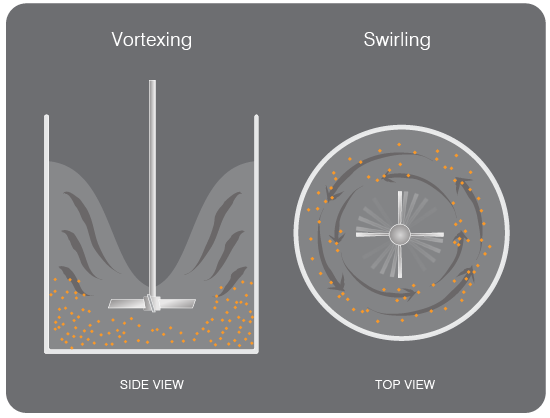 In solid suspension applications, the solid particles will swirl around at the bottom of the tank: no axial (top to bottom) flow is created to lift them up and suspend them in the fluid. Using baffles or offset mounting techniques will generate unbalanced loads that will act on the mixer shaft. When these unbalanced loads become significant, a heavier-duty agitator gearbox and bearing are needed. As a result, the mixer is more expensive. 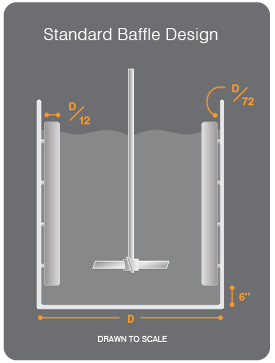 Baffles are our first choice because the loads generated are much less than those generated by offset angle or vertical mounting techniques. For smaller tanks (<10′ diameter), offset mounting will work just fine, and the extra cost associated with compensating for unbalanced load is minimal. For larger tanks, however, it becomes expensive to go with the heavier-duty mixer, and installing baffles is more cost effective. Baffles are long, flat plates that attach to the side of the tank to prevent swirling & promote top to bottom fluid movement. They are most commonly used for blending and solid suspensions because these applications often use vertical, cylindrical tanks that tend to create swirling patterns, regardless of the type of impeller being used. 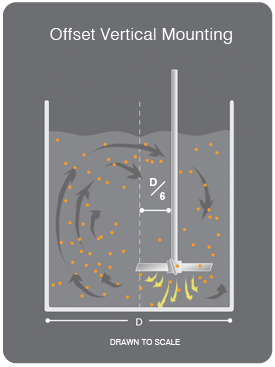 The flow pattern illustrated here shows that the use of baffles results in excellent top-to-bottom circulation and great radial mixing. Number of baffles = 3 to 4 (4 is ideal, but 3 will result in sufficient mixing). Adding any more than 4 baffles will not result in any significant mixing improvement. 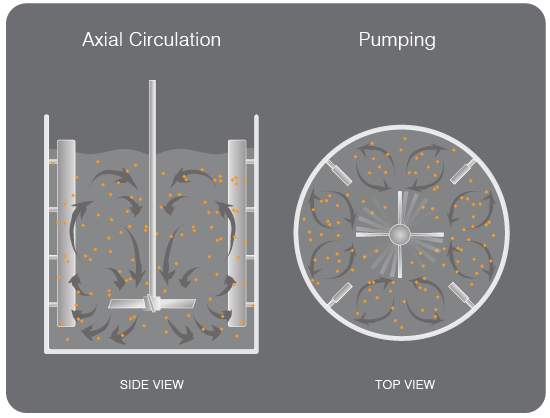 ** When agitating slurries, baffles are often located up to 1/2 of their width from the vessel wall to minimize accumulation of solids on or behind them. Square or Rectangular Blending Tanks: Most blending applications that use square/rectangular tanks don’t need baffles because these tanks are self-baffling. However, they are less suitable for solid suspension because “dead spots” are formed in the corners. High Viscosity Mixing: For high viscosity mixing (viscosities over 5,000 cps or Reynold’s Numbers < 10), the same power is consumed by the impeller, with or without baffle, so they’re seldom used. With axial-flow impellers, an angular off-center position where the impeller is mounted approximately 10-15° from the vertical, can be used (Fig. 4). It’s worth noting that the angular off-center position used with axial impeller units is usually limited to those delivering 3 HP or less. The unbalanced fluid forces generated by this mounting can become severe with higher power. 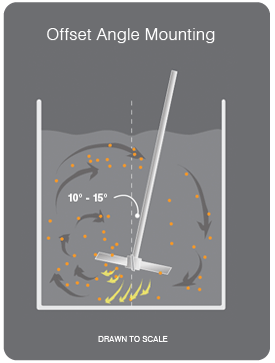 If an angle mount is not available, the mixer can be offset while being placed vertically in the tank. The rule of thumb for this is to offset the mixer on the x-axis, 1/6th of the total tank diameter. So, for a 60″ diameter tank the mixer would be offset 10” from center (60”/6 = 10”). As you can see, baffle configuration and mixer mounting have a significant impact on the mixing process. When engineered correctly, the right application of these techniques can decrease costs & increase equipment life while optimizing the mixing process. Once one of the blades falls off, the mixer becomes extremely unstable and will vibrate a lot (as I’m sure you know). Therefore without knowing the details of your mixer configuration I would suggest using a thicker gauge material for the blade tabs and using larger bolts, or a greater number of bolts, to securely attach the impeller blades to the tabs. Great post and introduction to baffling. One clarification: you wrote that the baffles should be installed 6″ from the bottom and extend to above the liquid level. What size tank is this for? Can you provide a length ratio with respect to the diameter or liquid height as you did with the baffle width distance from reactor size? Thanks! The clearance prevents solids building up in the corner between the baffle and the bottom of the tank. It has been our experience that 6” is generally sufficient regardless of the tank size. We don’t design or manufactures tanks so it is recommended to consult your tank designer for your particular application. Hello Kamran, Please call to consult one of our Application Engineers, we would be happy to assist.